Lords of Lord's, Lords of London, Oval Hero, have all been used in recent days and over the past 60 odd years to describe Pakistan's dominance over England, especially in tests played at Lord's, as well as, at the other ground in London - the Oval. London has a special place in Pakistani hearts and it has truly been a significant location for a lot of cricket success that Pakistan has had over the years. The World T20 Final in 2009 was won in London, at Lord's. The ICC Champions Trophy Final in 2017 was won in London, at the Oval. Pakistan won their first ever test outside the subcontinent in London in 1954, at the Oval. Both Lord's and the Oval are part of Pakistan's cricket history and besides Australia, there is no other team in the world that has had as much success as Pakistan has had against England in London. Here's a look at some amazing Pakistan cricket feats in London. Pakistan's win over England in the 1st test of the series was their 5th test win at Lord's. This is the second most victories for a touring team at Lord's, behind Australia's 17. 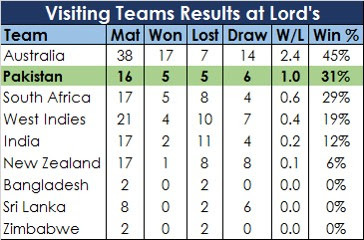 Pakistan have the second best W/L ratio and Win % at Lord's among all touring sides. Even though Pakistan's 5 wins at the Oval are behind West Indies' 6 and Australia's 7, Pakistan's W/L ratio and Win % at the Oval is the best among all visiting teams. In fact, no other team has won more games at the Oval than they have lost, while Pakistan have a lead of 2 over England. When it comes to test performance in London, combining the tests played at Lord's and the Oval, then there is no team that comes close to Pakistan's dominance over England. 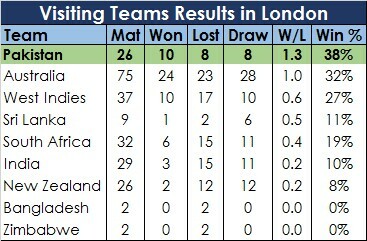 Pakistan's W/L ratio and Win % in London tests is significantly better than all other visiting teams. With this win over England, Pakistan captain Sarfraz Ahmed joined the likes of Imran Khan, Javed Miandad, Wasim Akram, and Misbah Ul Haq as the Pakistan captains who have led their teams to test wins at Lord's. Mohammad Aamir picked up 5 wickets in the just concluded Lord's test and his 2 wickets in 3 deliveries were crucial in scripting this historic victory for Pakistan. 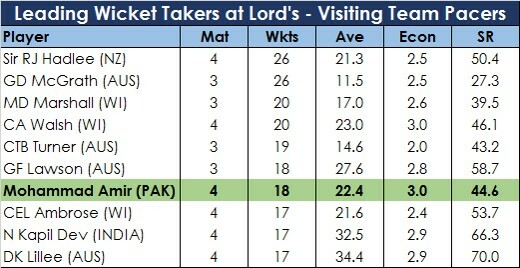 Aamir's 5 wicket burst brought him into the top 10 wicket takers among visiting team pacers at Lord's. 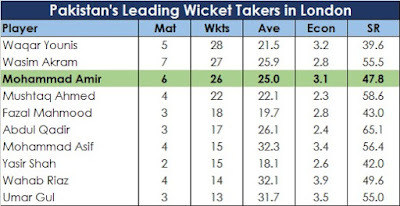 He is now the joint 6th highest wicket taking visiting pacer at Lord's with a few legends ahead of him. Among Pakistan's bowlers, Aamir has more wickets at Lord's than any other pacer and spinner. He has surpassed the feats of Pakistan's 2 Ws, Imran Khan, and Pakistan's legendary leg spinners. 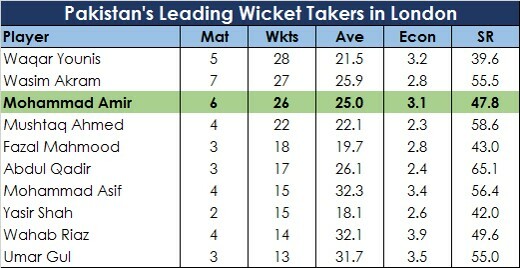 Overall, in tests played in London, Aamir is third on Pakistan's list of bowlers, very slightly behind the legends Wasim Akram and Waqar Younis in terms of wickets tally. Yasir Shah's 10-141 at Lord's that led Pakistan to victory in 2016 is the second best match haul by a visiting spinner at Lord's, behind only off spinner Sonny Ramadhin's 11 wicket feat in 1950. Yasir's 6-72 in the first innings of that Lord's test is also the second best innings haul by a visiting spinner at Lord's, behind off spinner Marcus North's 6-55. 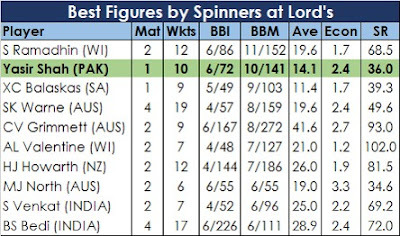 Among leg spinners, Yasir's innings and match hauls are right there at the top. 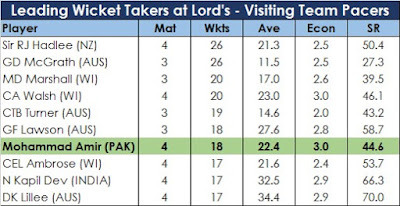 Yasir's average of 14.1 and strike rate of 36.0 at Lord's are also second best among all visiting spinners. Not many teams and individuals come close to Pakistan and its cricketers' achievements at Lord's and in overall in London. They have faced more success than any other visiting in London and have just become the only team to win two back to back tests at Lord's in recent times. They have won two ICC trophies in London and they will have the opportunity to win the one that they haven't when the ICC World Cup comes to London next year! Pakistan have truly earned the tag of being the Lords of London and with the way this young team is playing right now, it seems like they will be holding on to this tag for some time to come.